There are a lot of bad words out there. And most of them can be found inside companies, where good people use bad words for the wrong reasons. Of course not. People don’t talk that way in the real world. Yet, for some reason, they do talk that way—and, more frequently, write that way—in the corporate environment. My question is: Why? Where do all these bad words come from? How do they catch on so quickly at so many companies? Why do so many otherwise normal people feel so comfortable using them in conversation, and writing them in e-mails? I put this question to a colleague of mine, a writer and editor who would cut off his fingers before he ever wrote the words “core competencies” or “low hanging fruit.” And his answer was interesting. It’s an interesting viewpoint. And as I thought about it, I started to agree with him. Bad words are like bad kids . . . they don’t start out bad, but they turn bad quickly. I’m reminded of the two popular characters in the movie, “The Breakfast Club.” You know, the jock played by Emilio Estevez and the popular princess played by Molly Ringwald. You knew these types of kids in high school. Very popular . . . and very shallow. Maybe they were once nice kids, but they became so popular that they forgot how to behave. They are invited to all the parties, and everybody wants them around. And as such, they get big heads, and they lose their sense of self. They think they need to be all things to all people, and because of that they become incredibly superficial. And the more superficial they become, the more popular they become. And the more popular they become, the more superficial they become. It’s a vicious cycle that never ends. I think that’s what happens with many corporate words, too. There’s nothing inherently bad about words like Synergy, Proactive, World Class, and Paradigm. Once, long ago, they actually meant something. They were useful, once. But they’ve become so popular that they simply don’t mean anything anymore. We’ve overused them, misused them, and basically sucked any meaning out of them whatsoever. Let’s look at some of these Molly Ringwald words and see if we can figure out where they went wrong. World Class. I once reviewed the communication vehicles of a large financial services company. Scattered throughout all their materials—internal and external—was the phrase “World Class.” Their analysts were World Class. Their products were World Class. Their devotion to service was World Class. And she couldn’t tell me. And that’s when she told me her little secret. In other words, if you want to say something is really good but can’t point to any specific reason why it’s so good, call it World Class. It’s a way of saying you’re the best without having to prove it. Synergy. This is a word that actually held quite a bit of meaning, at one time. It was initially used during a merger or takeover, to talk about how the two companies together would be stronger than they were apart. But once it got out there, it got really popular really fast, and people started using it to describe everything from projects and products to initiatives and corporate cultures. Now, it’s what I call an “eye glazer word.” As soon as you read it, your eyes begin to glaze over, and you lose interest in whatever it is that you are reading. Proactive. Again, this was once a useful word. If you were proactive, you were ahead of the game, creating change rather than just reacting to it. You were strategic. You were forward thinking. You were proactive! Now? Well, I once read an article in a company newsletter that talked at great length about “Proactive Goal Setting.” Wouldn’t all goal setting, by its very nature, be proactive? Did he really think that if he left out “proactive” and just called it a “restructuring” that employees would then assume it was some kind of half-assed, reactive restructuring? As I said earlier, none of the above words is inherently bad. They’re just too popular. They are too shallow. If everything is World Class, then nothing is World Class. 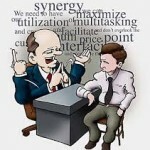 If we assign the word Synergy to anything relating to two or more things coming together, it loses all meaning. And when we insert the word Proactive into any sentence when we want to sound like we’re really on our game, it becomes a very superficial word with little substance. And when it comes to these and all the other bad words, I only have one question: Can they be rehabilitated? If we stop using them for a while, will they regain their meaning? If we stop abusing them, can they one day add value to our communications again? Father Flanagan would no doubt say yes. Me? I’m not so sure. I think once a word turns bad, we’ve lost it forever. 2 responses to Where do bad words come from? How true it is, and I would take it one step further. I believe that execs really don’t have a clear idea any more of how they plan and think about their big business decisions, or they are unable to clearly articulate what they are getting at. So they hide behind words that are meaningless so no one will ask questions. I also have come to realize that no one pushes back on these meaningless phrases because they are afraid of looking stupid in meetings—like they’re not privy to the secret password. I find that when I have the courage to ask what they actually mean by what they just blabbered on about, all of the sudden everyone perks up because they were dying to ask the same question. Good article but ironic that his deconstruction of “World Class” begins with a reference to communication “vehicles”. Another overused word that you won’t be using at your neighbour’s barbecue.